Looking for a unique speaker or trainer for your organization? Dave Wenhold has over 20 years’ experience as a Washington D.C. insider, change agent and public speaker. If you are looking to book an energetic and humorous speaker for your next event, don’t miss out on booking Dave now! He shares his experiences in dealing with Presidents, Members of Congress and key decision-makers in the nonprofit, association and corporate worlds with his audiences in a no-holds-barred style that connects with your participants. This style encourages audience interaction, a strong connection to the content of the presentation and, more importantly, a fun and interactive seminar that gains and holds their attention. Why you should book Dave Wenhold for your next event. Whether it’s politics, team building, strategic planning, leadership development or a customized keynote, Dave delivers motivating, persuasive, challenging and inspirational seminars that are relevant to your audience’s needs. Dave’s goal in speaking for organizations and companies is to Engage, Empower, and Entertain YOUR crowd all at the same time. Speaking for over two decades, Dave has found that people enjoy seminars and learn more when they become invested in the conversation and involved as partners in the seminar. For an example of this crowd participation, please click on the video below to see for yourself. How is Dave different than other speakers? Dave has spent 20 years as an advocate in the epicenter and halls of power in Washington. He has worked on Capitol Hill and been a lobbyist for most every industry in America. He has created charities to give back to Americans in need and was the first lobbyist ever awarded the Presidential Call to Service Award, the country’s highest award for volunteerism. He has been a frequent political speaker on CNN, FOX, MSNBC, CSPAN, and many other news outlets. Dave is known as a straight shooter and enjoys sharing his stories of how Washington functions and, oftentimes, its dysfunction. 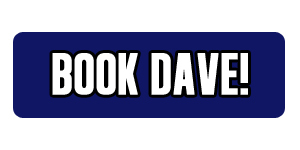 For a full bio on Dave, please click here. If you are looking for a unique and high energy speaker that will WOW your crowd, then you need to book DAVE now for your next event.